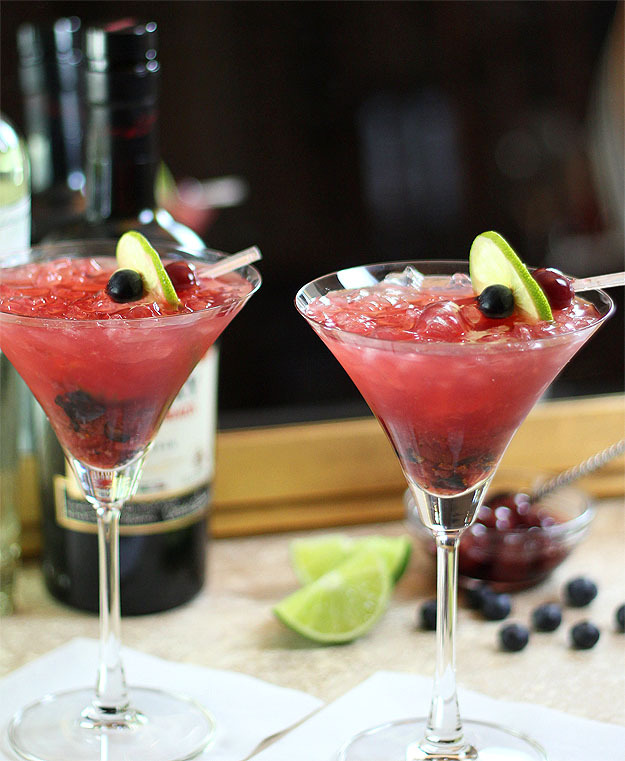 Not just for margaritas, tequila is combined with blueberries and maraschino cherries for this Tequila Smash Cocktail. This is a very special Happy Hour Friday. A sweet friend I’ve met on Twitter is getting married this Saturday and I’m part of a large group that wanted to celebrate with Nelly (Cooking With Books), even if only in a virtual sense. I remember seeing her tweet, not that long ago, ‘And…I said YESSSSS!‘ and it was exactly as I suspected. A ring was proffered, a request of the most sincerity was made and our Nelly said YES to her beloved “M” as she affectionately calls Brian Murray, her fiancé and soon to be husband. Nelly and I connected by way of goat. That’s right…goat. Although we had tweeted a bit before, it was during the Goaterie challenge I helped put together this past year that we saw each other in the hallway more often; we chatted up a bit and got to know each other better. I knew she had a fellow in Martha’s Vineyard and was dying to get back to the US to be with him. Now, she will be; forever and ever. Nelly and Brian are getting married on Saturday in Martha’s Vineyard and the food blogosphere is all ‘atwitter’ with excitement! I thought it important that I find a cocktail that seemed appropriate to the occasion. Oh, I’m sure they’ll have a special bridal toast (they could try my friend Lora’s Negroni Sbagliato with Prosecco!) but if there were a big reception and we were there more than virtually, this is the cocktail I would make. Nelly comes to us from the Dominican Republic and brings some of that spice with her, so I wanted something with some oomph. 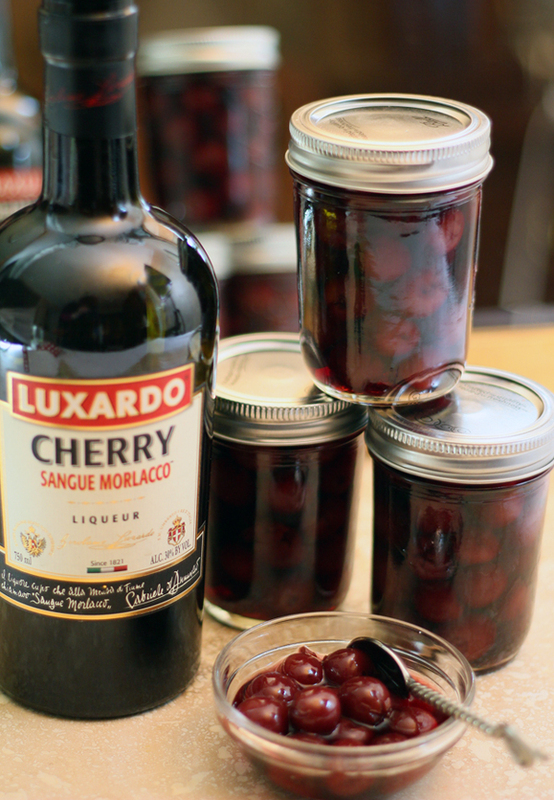 I had just finished making some jars of Luxardo infused cherries, my version of Maraschino cherries, for gifts and wanted to use some of them. It seemed prophetic that I had also just received a fantastic bottle of Tanteo Tequila with a couple of small bottles of Tanteo Infused Tequilas. One was their Tropical Infusion; how perfect was that? I found what I think is also the perfect recipe from a bartender at The Gramercy Tavern in New York City. 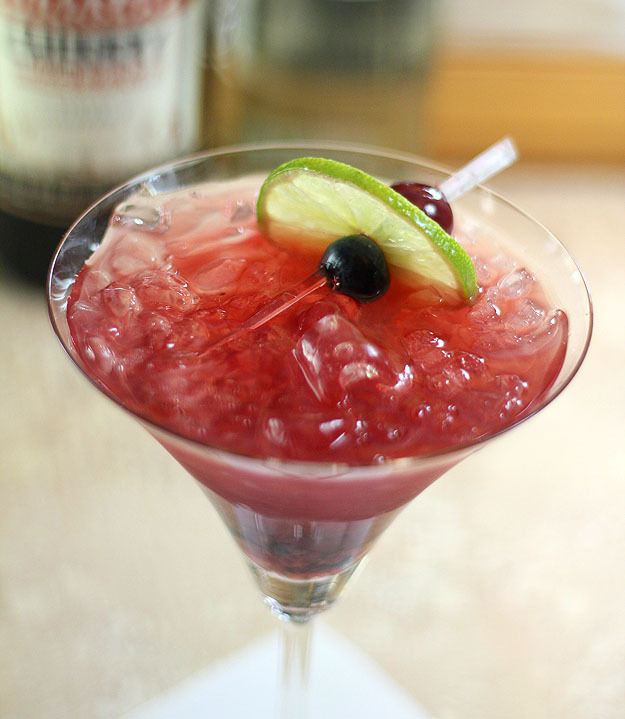 Combining tequila with blueberries, cherries, lime juice and Luxardo, it’s fruity and pretty but with a real bite. Don’t let that pretty pink color fool you; this is not a girly girl drink at all! Wishing Brian and Nelly a wonderful day and a lifetime of love. Hugs and Kisses to both of you and of course, Cheers! Muddle the cherries and blueberries in the bottom of a shaker. Add the tequila, maraschino and lime juice to the cup, fill with ice and shake several times. Pour the contents of the shaker into two rocks or martini glasses, ice and all, and serve with a lime wheel speared between a cherry and a blueberry. To make the maraschino cherries, I used a large jar of sour cherries in light sugar syrup. I drained the syrup and rinsed with cold water and drained them well on paper towels. I've made them in the summer using fresh sour cherries but I like to gift them for the holidays and have found that the ones that are canned work just fine too. I packed them loosely in 8 oz Ball jars and then covered them with Luxardo liqueur and let the jars sit for several days. These are easy and so superior to the sugared and artificially colored maraschino cherries available at the grocery! Store in the refrigerator; they will keep for several weeks. Wish I could have obliged; I so know that feeling! Take good care, K? Your photos are stunning and so is this drink!!! Gorgeous Barb! Thanks so much Aggie; after almost 2 years of gimping around with a leg injury I feel like the time that I can now afford standing is starting to help me style and take photos I can actually be proud of; your comment means a lot…I’m hoping that time, more experience and yes,the basic ability to be able to stand and get the work done is starting to show some results I’m no longer ashamed of. Finally. This cocktail looks really yummy Barb! MMMMMmmm I can taste it from here! Gorgeous looking cocktail, Barb! I feel like I could literally reach out and grab that drink from the computer screen…tasty images. Good stuff in this drink! Thanks Cristina…I loved the cocktail. It was most definitely a ‘one drink’ one for me. It’s pretty face belied it’s potent punch! What a wonderful way to pay tribute to Brian and Nelly’s big day. I think I may adopt this cocktail for an “anytime” celebration, such “Yay, it’s Friday!” Wonderful, Barb. There is simply no comparison. The flavor, the texture, all are improved. I even think the color; I much prefer the less artificial burgundy look compared to that bright, fake red. Easy too! A cocktail perfect for a wedding between two great people. Love this recipe, Barb. And happy birthday to a wondeful woman!! I hope it’s everything you wanted and more. Was fun to make something for them…to think outside the ‘glass of champagne’ box. And thank you…what a sweet comment. I had a very nice day, thanks. I would love this! I will eat/drink anything with cherries, they are my favorite. This drink looks awesome. Thanks; it does pack a powerful punch…but it’s good! Cheers! 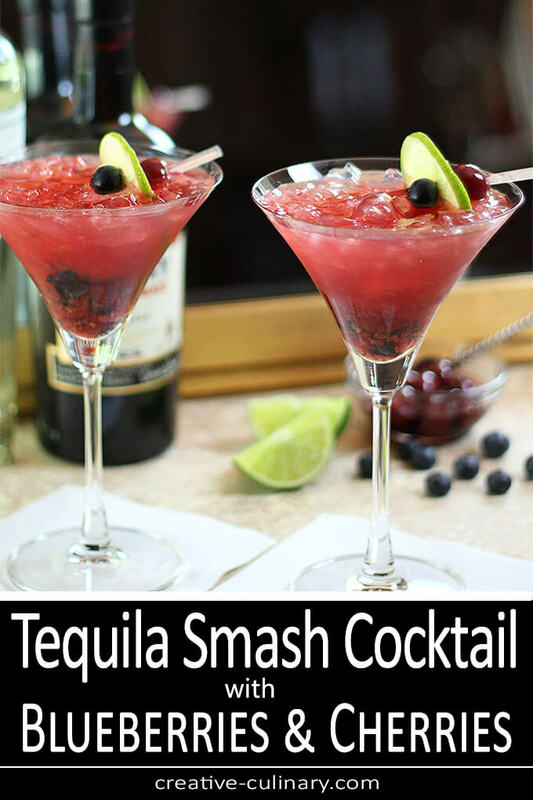 Tequila Smash sounds like an appropriate name. Easy to get smashed! This sure does sound tasty with the tropical infusion! Wow this is gorgeous. I never would have thought to make my own maraschino cherries but it looks so easy, and I’m sure tastes 1000x better than the store bought ones. This sounds like the perfect drink for Nelly and her new hubby to celebrate with. It is so easy and they always have been a hugely popular gift too. So good they really make those artificial ones pale by comparison and make the look, well, artificial! Like I said earlier, you really have to do a book of your fabulous cocktails! This is a beautiful one and perfect for the future husband and wife. Love that you made your own maraschino cherries and that you participated in this virtual bridal shower. I thought it was young and vibrant and with a lot of heat…seems perfect for a bride and groom, right Paula? The cherries are yummy…even just on vanilla ice cream. I hereby proclaim you the queen of cocktails. Love all these great drinks! I’ll take it…I love doing these. Thanks a bunch. Thank you for stopping by Rebecca; it was fun to do this for Nelly wasn’t it? It only keeps for several weeks if I don’t drink it all first! 😉 I never buy the maraschino cherries in the store because of all that fake stuff in them. Will have to make some of my own and try this, though, because it sounds fabulous! Amazing concoction! I definitely prefer your version of maraschino cherries, although pro bbl best not to give them to my kids 🙂 Gorgeous cocktail and so happy to celebrate Nelly’s Big Day with you!! There will be a day…in the meantime I’ll take some extra sips for you, how’s that?!! Oh my goodness. These look amazing. I don’t know if my husband would go for the drink, but it sounds so good to me! I pinned this because I HAVE to make those cherries. Heck, I’ve already made your coffee liqueur and cranberry liqueur, might as well do the cherries, too! Yes you must…so easy and great in anything you would typically use a maraschino for. I use them from Manhattan’s to Shirley Temples…all good! Those commercial Maraschino were great when I was a kid, but these days … not so much. I’ll have to try your version. Now that I’m used to them, the commercial color is garish too…but these are so good. I’ve done fresh ones in the summer but am always happy with the ease of these. I got a huge jar of them at the local HMart for $5; I like them better than the canned one. “Once you try these you will never go back…promise!”??? I will never go back anyway, but wow love your cherry recipe. I’ll get JP to do it. And that drink is gorgeous! And mmmm love the fruity flavor! Has to be the easiest recipe EVER with the greatest results. And thanks…Cheers to you my friend! And we’ll be dealing with a tipsy you for sure. Thanks Lora…if you knew how rushed I was to get them done to get to an event, well, thanks, makes it all worthwhile. Love the idea of making your own Maraschino cherries! So easy…finding the Luxardo is not always but there are other brands of Maraschino liqueur…this is just the one I’ve always used. I just love the name; the way it rolls off the tongue. Crazy but true. Sweet, sweet, sweet! All of it. So happy for Nelly and Brian. Love not only the cocktail you prepared but the thought put into it (noted your Tweet running out for 6 blueberries to make it perfect). Also ‘ditto’ on the Luxardo cherries. The list of offenders is lenghty in store bought Maraschino cherries certainly but the taste of the homemade cherries cannot be beat. Yeah…once I saw what I thought the perfect cocktail with ingredients I wanted to use, I HAD to. I give friends a jar of these cherries each year in their gift baskets…it’s the one thing I best not forget either! These photos are outstanding Barb! I love the Nelly story, I met her myself about a month ago and she has so much energy, it’s hard to keep up with her. I am so happy for her and for all of the lovely support she is receiving today for her Virtual Shower 🙂 This one is printed! Til we can clink glasses and imbibe together? Cheers! I know some only make them in the summer when they can use fresh cherries and cook and can them on their own but the truth is, sour cherries are not that prolific here and these have worked for me just fine for years. Unless I eat the whole jar; that might be trouble. You got booze! YAY! Tequila and maraschino cherries sound divine! Gorgeous clicks Barb! Oh Barbara, this looks so good!! And homemade maraschino cherries, extra good! Thank you for the kind words and definitely great recipe! Thanks for joining the virtual party and for all the suggestions and support, Barbara! Great fun exchanging mails and chatting over with each other. Love and hugs. Will cherish the moments forever. Thank you for all of your work; I know Nelly is so pleased.